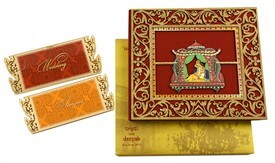 D-5679, Red Color, Shimmery Finish Paper, Laser Cut Cards, Hindu Cards. 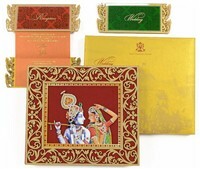 Radha Krishan Theme card. Front looks like a picture frame with heavy laser cut border and Radha Krishan picture in center with heavy crystal work. 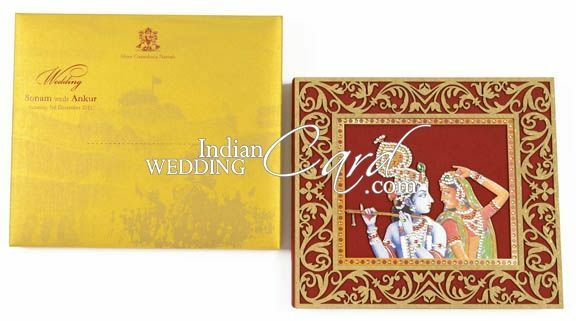 Inside left has another Radha Krishan theme painting.The right side has 2 Acrylics placed inside a box and is both intricately laser cut. Maroon fabric for card. 2 Plexi glass inserts. Inside box and mailing box envelope in yellow gold (300gsm) paper. Silk Screen Printing in Maroon and Gold color.